So what does the Council, and indeed the Church, say should be sung at Mass? Everything can be sung and in the more solemn celebrations (e.g. Easter , Christmas) this is what the Church envisages. However, there are varying degrees of solemnity and therefore varying degrees of singing. The first things that should be sung are those dialogues between priest and people (Introductory rites, gospel dialogue, prayer over the gifts, preface dialogue, doxology, post-communion prayer, final blessing etc.) and those parts which priest and people sing together (normally, Sanctus, Memorial Acclamation, Pater Noster). There is a second tier of singing Kyrie, Gloria, Credo, Agnus Dei, Prayer of the Faithful. Now as the liturgy is normally celebrated in this country this simply does not happen. In most parishes people start with singing some hymns at Mass. Many of the things the Church asks to be sung in the first and second tier are never sung at all. This priority (given in Musicam Sacram) is re-affirmed by the General Instruction of the Roman Missal in 2003. So there perhaps needs to be a re-assessment as we plan our liturgies as to what parts are actually sung, a need to look again at what is most important in the Mass. We must also look at what we sing during the entrance procession, the procession of the gifts, and at communion (which all belong to the third tier anyway). The Church actually provides texts to be sung at these times. These texts are to be found in the Graduale Romanum and the Graduale Simplex. These texts are what the Church intends to be sung at these times. These antiphons are drawn from sacred scripture and from the writings of great saints. They are hallowed by ancient usage and are chosen to enlighten the liturgy of the day. The antiphons form part of the text of the Mass (highlighted by the fact spoken antiphons are provided for occasions without singing). We would not replace the readings of the Mass with other texts, so why the antiphons? We tend to sing hymns in their place, which sometimes have little to do with the liturgy of the day. In the official music of the Church there are only two hymns given to be sung at Mass (Pange Lingua andCrux Fidelis). It is permitted to sing other chants than those provided by the liturgical books but these should be as an exception or an addition as the antiphons are normative. If we do sing other texts they are supposed to be approved by the Bishop’s Conference, only now, many years after the liturgical reforms, is this finally happening. How should these texts be sung? 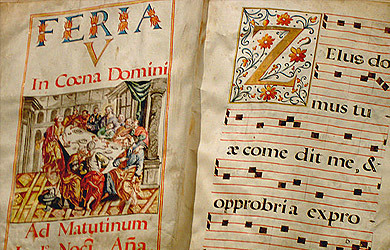 The official music of the Roman Rite is Gregorian Chant. This music highlights the text rather than the singer or the choir, and corresponds closely to the spirit of the liturgy. The Council stated that it was particularly suited to the Roman Rite and should be given pride of place. As in the previous tradition polyphony was also highlighted as having a special place. Of course other forms of music are permitted provided they correspond to the liturgy. These recommendations apply not to the texts but merely to the musical settings of those texts. The texts to be used in this singing are those explained above. Again this is re-affirmed by the new GIRM. Who should be doing the singing anyway? The Council underlined the need to establish and develop choirs in our churches and especially our cathedrals. It is recommended that all churches that can have a properly trained choir and that major churches should have more accomplished choirs. In fact if a choir is not possible it is recommended that trained singers or cantors should be available to lead the music. This all requires some effort on the part of priests to ensure that proper training is provided in sacred music for their singers and for their cantors. They also must be given the opportunity not just for musical formation, but this should be an opportunity for real catechesis. However, we must not forget the people in singing. They also have an essential role. The singing of the people is to be carefully fostered. This does not mean that they have to sing everything. Particularly in more solemn celebrations it is permissible for the choir to sing particular parts alone. The choir has two functions according to the General Instruction. Firstly, it is to sing the parts proper to it according to the different genres of chant. This implies it will perform these parts alone. Secondly, it is to foster the singing of the people as one means of encouraging active participation. We might ask ourselves, is this too much for us to manage? How can my little parish choir cope with all this complex music? There is help available. 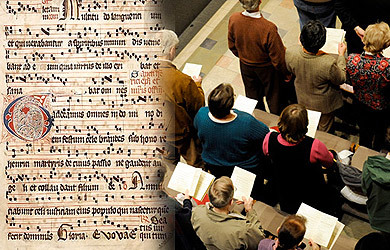 Although much of the music in the rich treasury of liturgical song is complex there are also many simpler melodies that can be used to sing the sacred texts, both in plainchant form and more elaborate forms. First among these should be mentioned two books both published under the aegis of Pope Paul VI. Jubilate Deo is a small booklet published following the liturgical reforms that contains the minimum repertoire of chant expected by the Church in a parish choir. It is a selection of simpler chants, particularly of the mass ordinary that any parish over time could learn. They are in fact so simple they could easily be employed at a primary school. The Graduale Simplex contains the full ordinary and propers of the Mass for every day of the year. The melodies are much simpler than those found in the Graduale Romanum and essentially consist of psalm tones with responses. These are both published by the Holy See. You may though be wondering what there is that is available in English. Firstly, in the new missal introduced in the UK in 2011 there are simple English plainchant settings of all the ordinary of the Mass. 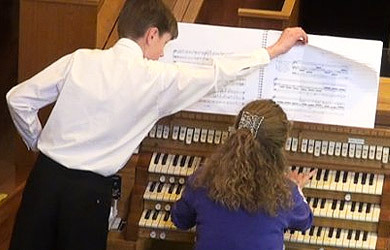 On the ICEL website there are also organ accompaniments to all of these tones. These settings of the ordinary are accessible to even the most musically illiterate congregation (although, as with any real art it will require some work to introduce, and some perseverance). Moreover, there are many new plainchant style Mass settings being produced. There are also now available settings of the propers of the Mass, most notably produced by the Church Music Association of America in their book Simple English Propers. There are also old Anglican settings of the Catholic propers from the Roman Rite available. Musicam Sacram, Sacred Congregation of Rites, 1967, no.7, no.27. Sacrosanctum Concilium, Second Ecumenical Council of the Vatican, 1963, no.116. Cf. Letter to Bishops on the Minimum Repertoire of Plainchant, Sacred Congregation for Divine Worship, 1974.